Strobing is the hottest new makeup trend, overtaking contouring as the hottest technique to get your face looking flawless. Strobing has been readily embraced by style icons like the Kardashians, but you don’t have to be a celebrity with a slew of professional makeup artists to achieve this look! It’s super easy to do at home and the results are totally gorgeous. While contouring uses a blend of darker and lowlight colors to create shadowing effects with makeup, strobing is super simple in that it focuses only on the light. It is essentially just highlighting to the max. To achieve this look you simply have to focus on highlighting the areas on your face where light naturally hits, and you have yourself an all-day luminous glow! The key to nailing this look is to choose the right highlighter for your skin tone. If you have fair skin, you’re better off finding a highlighter with champagne tones, or if you’re on the side of light-medium go for pink undertones. Medium to medium-deep skin tones benefit from products with gold undertones while people with dark skin tones should look for products with burgundy or terracotta tones. The next step in strobing is to apply the highlighter to the places on your face that catch light: the corners of your eyes, your cheekbones, below the brow bone, the bridge of your nose and your cupid’s bow and chin. Liquid and cream products will really enhance the dewy, soft-light effect, and the best way to apply them is to use your fingers before blending with a brush. 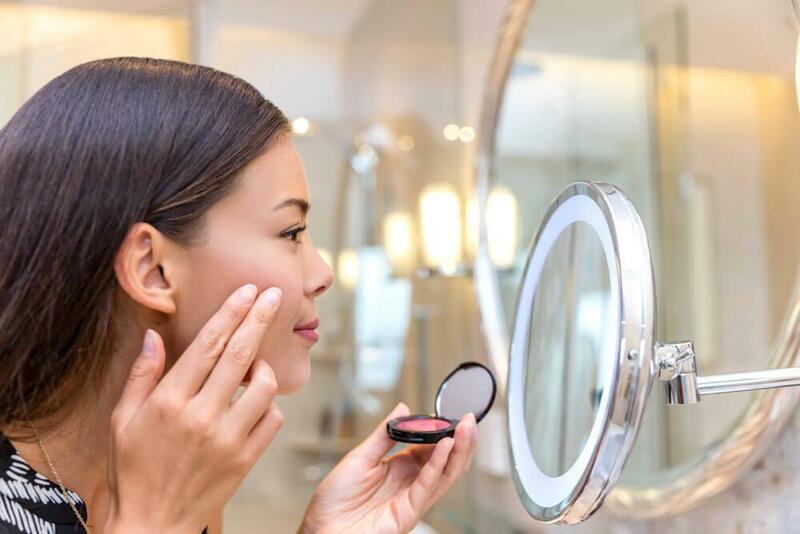 If your skin tends to get oily, skip the worst offending parts of your face (probably the forehead and chin), and opt for a powder or shimmery product instead of cream and liquid. This technique is perfect for the summer, not only because it’s much more lightweight than contouring, but because it will also enhance the natural glow you’re getting from the sun. Once you master this technique it’ll look like you have your own ethereal sun following you around all day and night and people will be in awe of your radiant skin!